Once the yeast mixture is ready, place all of the bread ingredients in a mixing bowl along with the yeast mixture. Stir the mixture together until it forms a loose dough. It won’t take more than a few minutes! Cover the dough with a tea towel and let it sit from 1-4 hours. Using a bowl of water to wet your hands, break off small pieces of dough and work them into small finger shapes and place them on the baking tray about a finger width apart until the tray is full. 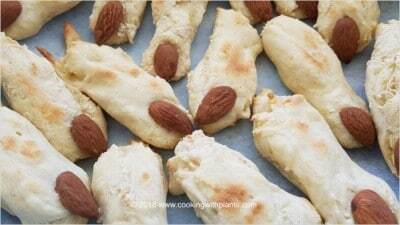 Now add whole almonds to the tips so they look like fingernails. After 6 minutes pull the fingers out and turn them over before returning to the oven for a further 6 minutes. Serve with your favorite sides, dips and soups! Great served with my Black Hummus recipe. If you make this recipe, please take photos and share them on my Instagram page or in the Cooking with plants facebook group… I would love to see your creations… this is one time I ask you to give me the finger hahahaha!